Still enjoying the great London experience but unfortunately its back to work next week. 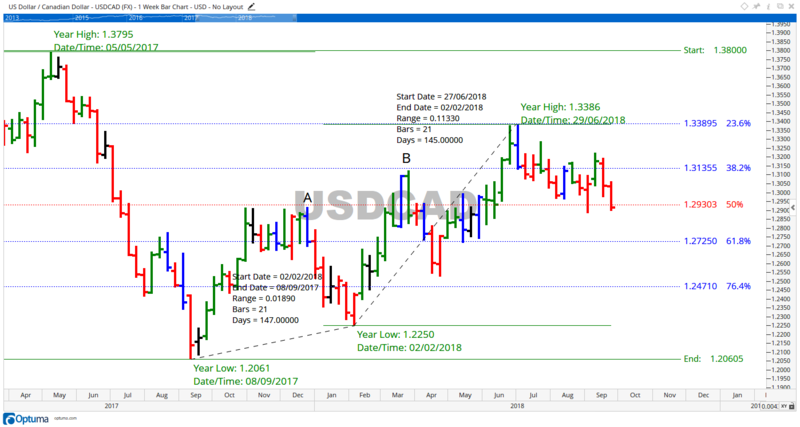 The USDCAD chart has given us some great examples this week with the mid week reports and now the focus is on the Weekly chart. Have a look at the weekly chart below, then continue below this for the Daily chart. You can right click on the chart and download it for a better view. Lets assume that you read the midweek reports and noticed that the close of the bar Sept 18 was very close to the low. With all of the mid week information you may have been really tempted to short this chart with an entry at say 1.2975 just below the low. Where is your stop? It would be correct to have it just above the high of the bar at maybe 1.3070. Thats where I would have mine. This means we have a stop factor of 100 pips thereabouts. So looking at todays bar, it has closed on the lower half of the bar…and we have around 60 pips in our favour. Imagine a trade at $10 USD per pip, or even $25 per pip if your account is big enough to take the trade. At $10 per pip you now have $600 USD unrealised profit. Great money for your hard work in studying trading. The next question you need to ask yourself is where do I exit? Or how do I manage the trade? Lets us throw a spanner in the works for a second. You can see on the daily chart that there is a major low August 28, an inside bar, and a known 50% level. 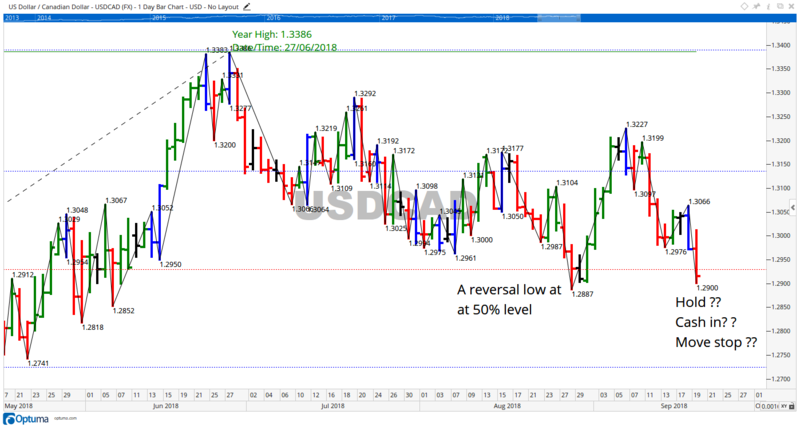 QUESTION: DO YOU HOLD THIS TRADE OR TAKE THE 50 – 60 PIPS???? Thats what you need to answer for yourself, and I am equally sure we could have a major debate on what the answer should be, but there are no right or wrong answers. There are only winners and losers, profits and losses. But as this trade is current, make a decision today and then look at this chart in a week to see what transpires. Thats what makes great traders, the ability to make decisions based on proven analysis, live with the result no matter what the outcome and learn from each trade until you become a master trader. The profits will come if you persist, as I have always believed the amount of your profit is directly proportionate to the amount of research and testing that you have done. Hope this helps, back to Australia next week and looking forward to seeing you soon. This entry was posted in premium analysis. Bookmark the permalink.